Since the University Climate Change Coalition’s (UC3) launch in February 2018, UC3 universities have convened climate leaders in their region from local and state government, private industry and NGOs at cross-sector forums. 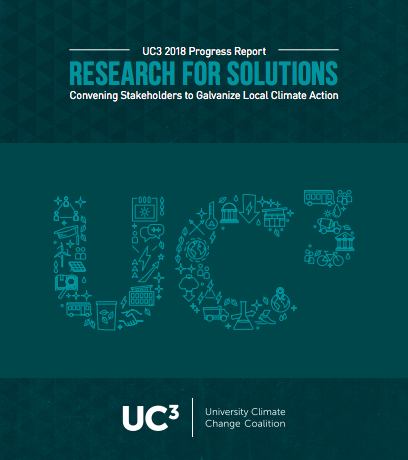 In a report entitled Research for Solutions: Convening Stakeholders to Galvanize Local Climate Action UC3 highlights how research institutions can play an invaluable role in stepping-up climate action in their communities. Each of the schools is making ambitious strides to reduce their institutional footprint and increase resilience to the shocks of climate change, read the report to find out exactly how. The case study series “Solar University Network: Innovation in Solar Energy Finance & Development” highlights higher education investment in solar energy projects. The purpose of these case studies is to showcase working financial models for universities and other higher education institutions to invest in solar energy on campus. 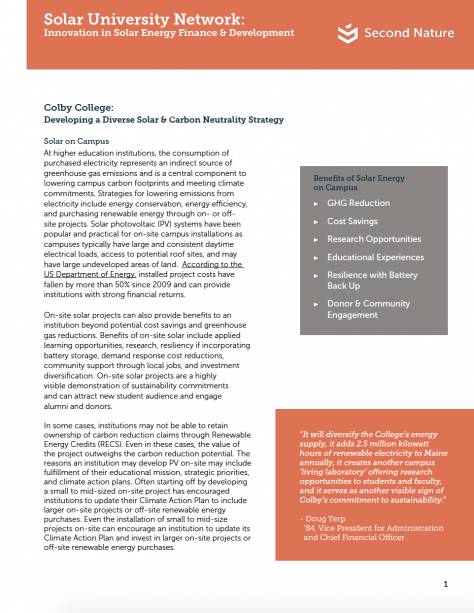 In this case study, we look at how Colby College uses a variety of strategies including on-campus production, green power purchasing and carbon offsets to tackle their greenhouse gas emissions. Download. See other resources from this project at www.solarendowment.org/resources. Luther College: Third-Party, Supporter-Financed Campus Solar. An Approach and a Partnership that Works. The case study series “Solar University Network: Innovation in Solar Energy Finance & Development” highlights higher education investment in solar energy projects. 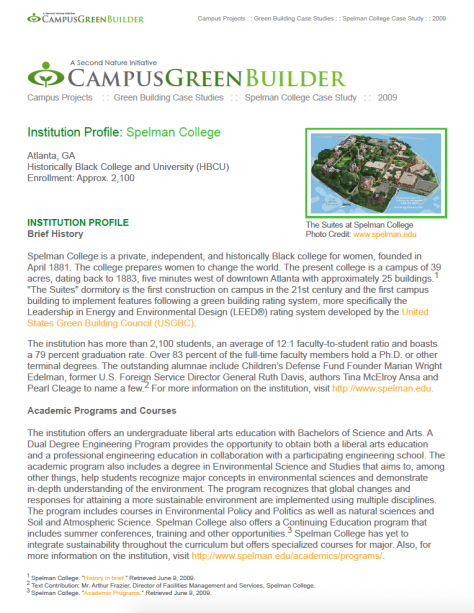 The purpose of these case studies is to showcase working financial models for universities and other higher education institutions to invest in solar energy on campus. 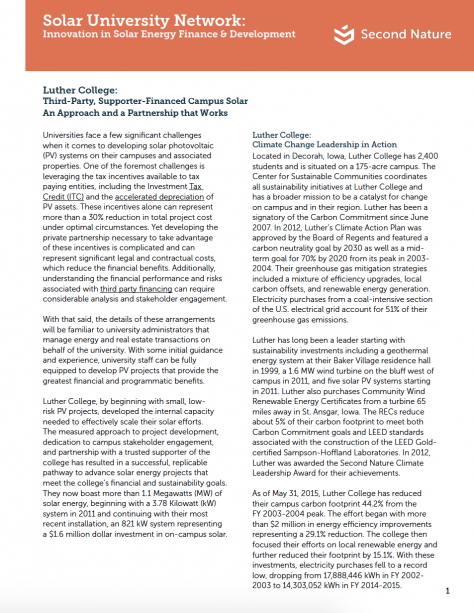 In this case study, we look at how Luther College uses donors and supporters to fund their renewable energy campus initiatives. Download. The case study series “Solar University Network: Innovation in Solar Energy Finance & Development” highlights higher education investment in solar energy projects. The purpose of these case studies is to showcase working financial models for universities and other higher education institutions to invest in solar energy on campus. In this case study, we look at how Wake Technical Community College uses an institutional foundation to fundraise and support solar projects on campus. Download. The case study series “Solar University Network: Innovation in Solar Energy Finance & Development” highlights higher education investment in solar energy projects. The purpose of these case studies is to showcase working financial models for universities and other higher education institutions to invest in solar energy on campus. 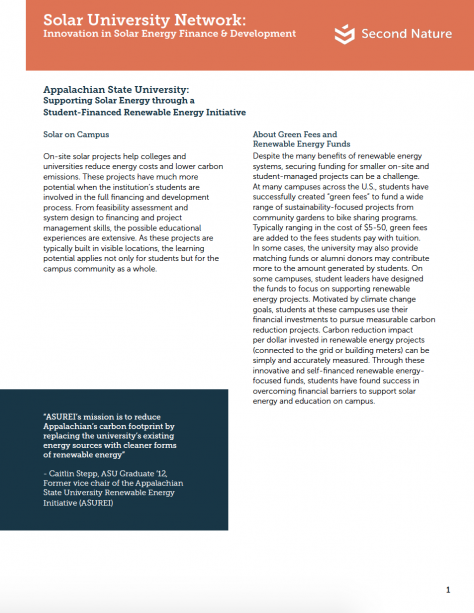 In this case study, we look at how Appalachian State University finances energy projects and initiatives through a student-driven group and fees. Download.